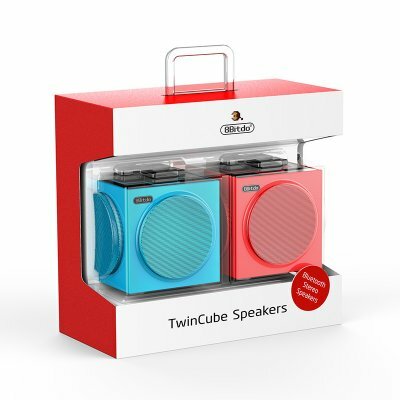 Successfully Added 8Bitdo Twin Cube Stereo Speakers - Bluetooth 4.2+EDR, A2DP, AVRCP, HFP, 800mAh Battery, Retro Design to your Shopping Cart. With their iconic design, these 8Bitdo twin cube speakers pay homage to the Nintendo gaming consoles that so many of us grew up with and rightly loved. The blue and red twin speakers are visually appealing with a nice design with a premium finish. Each speaker is a perfect little cube with circular metal mesh speaker grills that contrast nicely with the sleek smooth plastic of the speaker body. The red and blue speakers match the colors of the Nintendo Switch and on the top of each speaker is a NES style directions pad which is your speaker's controller. When it comes audio these speakers impress with a 45mm driver unit and 100Hz to 16000KHz audio spectrum you get a clear crisp quality that brings stereo audio as each can operate on a different channel. Each speaker unit includes a driver and passive radiators which works well to produce a full range sound. So despite their compact size, you have a good quality sound setup, the treble is sharp and clear, there is good mid-range accuracy and a base with a good punch on it. The speakers are quick and easy to pair with your smartphone or other Bluetooth enabled device. Just ensure each speaker is turned on then search for and connect them to your device through its Bluetooth menu. You can use the speakers one at a time but its worth using them together for the full stereo effect. Once synced up you can use the buttons on the top of each of the speakers to navigate tracks, pause the music or even take incoming calls. If you want a full sound quality compact wireless speaker then the 8Bitdo is a great option and fantastic value for money. you can use both speakers together or split them up and use as two independent mono speakers. with their tip of the hat to Nintendo and modern styling they are sure to be a big hit. These wireless Bluetooth speakers come with 12 months warranty, brought to you by the leader in electronic devices as well as wholesale speakers and audio gadgets..